So many orders for commission paintings have come in that I am almost totally booked until Dec. 25, and will need to work hard to keep up with them! So I have had to put my daily paintings aside for now. Here is a commission I am working on right now. A pet portrait of a sweet little "princess". She sleeps on a red and gold brocade cushioned couch and eats from a crystal bowl. Above you can see all the photos of her that I've taped at the top of the easel for reference. To the left is the Pet Portrait questionnaire filled in by the client. This gives me extra details that I can refer to in order to get the personality and exact colors. 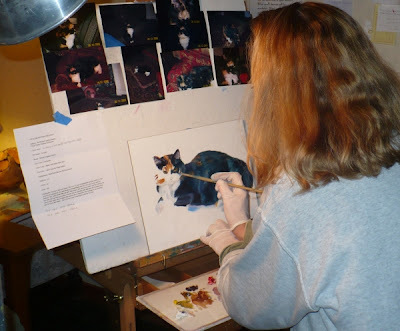 Click here for the post with the finished cat portrait.